This paper is an analysis of the impact the U.S. sanctions on Russia are having on India, especially in defence and energy. As India and the U.S. prepare for the first 2+2 Dialogue on September 6, this paper recommends ways in which India can balance its long-standing strategic ties with Russia and growing proximity to the U.S.
Can Great Global Disarray Provide Real Opportunity for India? 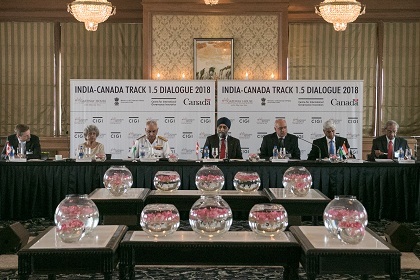 During The Gateway of India Geoeconomic Dialogue, Shyam Saran, former Foreign Secretary of India and Dr. Richard Haass, President, Council on Foreign Relations discussed the relationship between India and the United States in a changing Asia. Dr. Rajiv Kumar, Vice Chairman, NITI Aayog, in his keynote address spoke about India's future and delivering private solutions to public problems. Urve Palo, Estonian Minister of Entrepreneurship and Information Technology, and Dr. V.K.Singh, Indian Minister of State for External Affairs, gave the opening remarks. 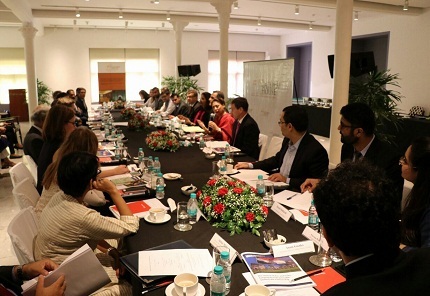 Gateway House: Indian Council on Global Relations launched the U.S.-India Task Force report, “Forging an indispensable democratic partnership”, yesterday in Mumbai, in the presence of task force co-chairs, Former Ambassadors Nirupama Rao and Richard Verma, task force members, and members of Gateway House.